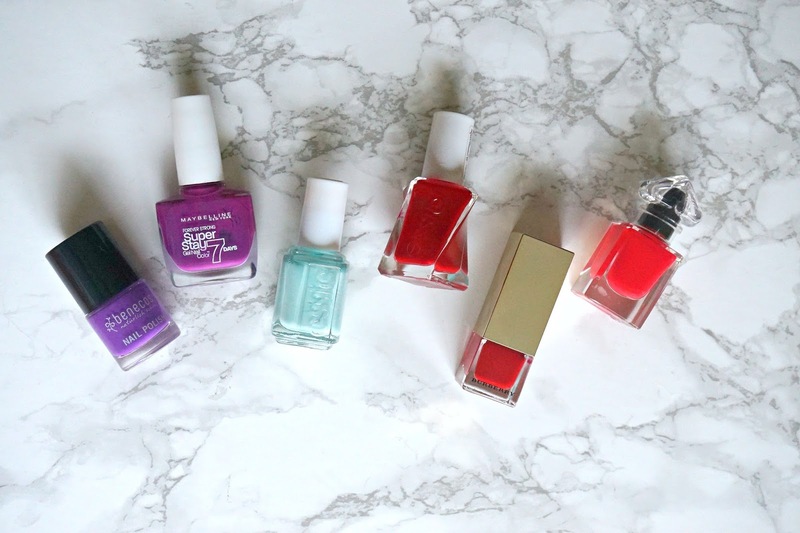 A nail polish for every budget featuring Benecos, Maybelline, Essie, Burberry & more! I recently downsized my ridiculously large nail polish collection and in doing so, realised that it is one of the few parts of my whole beauty collection that I tend to favour budget/mid-price products rather than high end. Today I want to share my favourite nail polishes for all budgets with you and I would love to hear your favourites and also if you prefer budget or high end brands. Maybelline Superstay 7 Day Nail Polish: The least expensive polishes that I really rate are these Maybelline gel polishes. They have a wide brush, which makes application easy and give opaque colour with just one coat. The biggest bonus with these polishes is the wear time - they last around 5-7 days on me before chipping. Plus they are almost always on offer in Boots, where they are currently Buy 1 Get 1 Half Price. Benecos Maverick Nail Polish: For cruelty-free lovers, a great budget brand is Benecos. This beautiful purple polish needs two coats to achieve full opacity and lasts around 3/4 days without a top coat but around 7 with my favourite Essie Gel Top Coat. Benecos polishes are free from toxic chemicals, such as formaldeyhde, phthalates and TPHP. Essie Nail Lacquer: I went through a phase of only ever using Essie nail polishes but the thin brush on the ones that I bought from the U.S. really began to grate on me and I gave up on them. When Boots started to stock Essie, I went back to them because the brushes are now wider which means that it is now quick & easy to paint my nails without worrying about layering and streaking. Essie Gel Couture: I absolutely love this range of gel polishes because they are fully opaque with one coat (although I sometimes use two), they have a glossy finish and they last a good 7 days on my nails. The range of colours is gradually being extended so I am hoping to add more to my collections when they are on offer in Boots. Burberry Nail Polish: This is my first luxury nail polish (actually no - I used to own a Chanel nail polish but gave it away because I HATED the formula & thin brush!). I love the stunning packaging, although the gold was limited edition for Christmas, the regular Burberry packaging is equally as striking. This is my favourite red nail polish because it is a true red and I only need two coats to achieve a fully opaque finish. It also has a high-shine finish and lasts pretty well - around 5 days on me. Guerlain La Petite Robe Noir Nail Polish: This is a perfumed nail polish, which is pretty unique but also retro at the same time - I have memories of using scented nail polishes when I was younger but none that had a particularly beautiful scent, as this does! I love the packaging of this nail polish and I find that the short wand/wide brush combination means that precision is easy when painting my nails. It also has a glossy finish, which I love. I would love to hear what your favourite nail polishes are? Do you favour budget or high end? I would love to hear your thoughts and recommendations in the comments below! All products are bought by me, unless otherwise stated. In this case, the Benecos & Guerlain polishes were sent to me. Opinion is always my own.